Tax Season is upon us again, and if you’re like many people, you’re feeling increased stress levels at this time of year. Whether it’s due to the time pressure of getting forms filled and filed by the deadline, or coming up with funds to pay the bill, you owe it to yourself to keep your stress under control. Stress that’s left unchecked can contribute to many health problems, such as high blood pressure, heart disease, obesity, and diabetes. Additionally, when you experience stress, your body releases a hormone called cortisol. When stress is chronic, such as during the weeks surrounding tax season, the concentration of cortisol in your body stays elevated with undesirable results. For example, you will crave foods that will give you quick energy, such as candy bars and potato chips. Those foods aren’t going to do you any favors already, but the presence of cortisol will cause many of these extra calories to be stored as abdominal fat. You may also find it hard to eat in moderation while stressed because cortisol can interfere with the chemicals in your body that control appetite. Exercise. You can reduce cortisol levels in your body by exercising just thirty minutes each day. Take a brisk walk on your lunch break, or come to one of my many half-hour classes. Eat Well. Be intentional about eating nourishing foods such as vegetables, fruits, whole grains, lean protein, and nuts. If you eat these foods, you will keep your blood sugar level steady, and you will be less likely to give in to the cravings that cortisol causes. Don’t skimp on sleep. By getting at least eight hours of sleep each night you can reduce your cortisol level by more than half of that of people who get less than six hours. You really can sleep away your stress! Here’s a post of mine that may help you get those extra hours. Identify your stress. Generalized anxiety can be paralyzing. Take the time to sort out exactly what is causing you to feel stressed. Rather than saying, “My taxes are causing me so much stress,” figure out the specifics. Perhaps you are stressed because you can’t find a form that you need or you are trying to do your taxes alone without the skills that you need to pull it off. Once you pinpoint exactly where the stress is coming from, you can take steps to take care of that exact problem. Make time to relax. Taking time to unwind is not a luxury; it is a necessity if you are going to master your stress. Find something that makes you laugh and smile, get a pedicure, or just breathe deeply. Your mind has a profound impact on your body; take advantage of this by finding time to relax every day. Why not get a head start on the 2019 season? Begin forming a plan to reduce the stress of next year’s tax time. Decide where you will keep the necessary paperwork throughout the year, gather phone numbers and addresses that you will need, and check with your tax preparer to see if your withholdings are optimal. 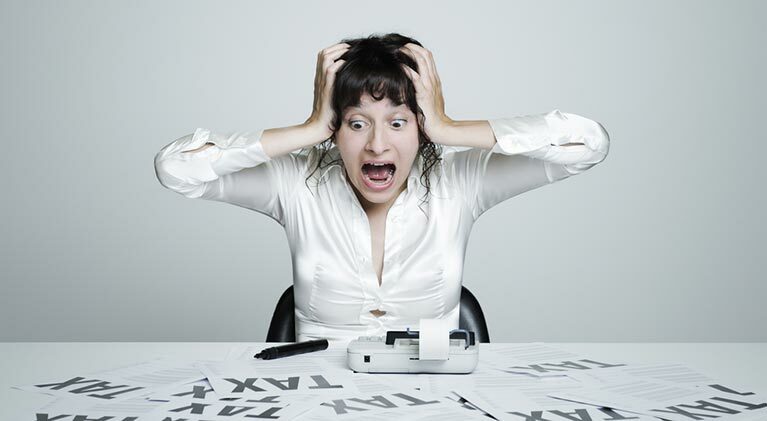 Make sure this is the last year that Tax Day causes you anxiety! What do you do to relieve stress in your life? I’m always interested in new stress-busting tips!